Thank you for your interest in Houston Play Therapy. Danielle Tschirhart, M.Ed., LPC-S offers individual counseling, school assistance, and supportive parent training to enhance development of your child's well-being. No child is too young to begin receiving the help they need and early intervention is the best way to help children overcome the struggles they face. 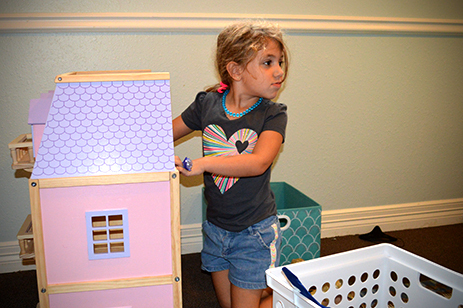 Houston Play Therapy considers each child an individual and utilizes the strengths of each family to help them attain healthy goals. Play is the natural language of children. Play therapy is used as a means to provide a safe environment for children to manage stress, learn effective coping strategies, and maintain pro-social relationships. Play therapy emphasizes building and maintaining a parent-child relationship that promotes communication, intimacy, and self-esteem. 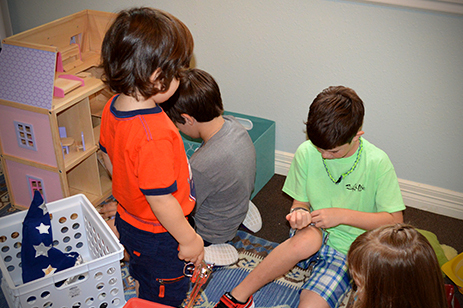 Houston Play Therapy gives guidance and tools to aid in parenting issues. Parents can also receive one-on-one instruction in their play interactions with their child. On-site visits to observe a child in their school or daycare environment. Recommendations can then be made to aid and support the teacher/student relationship with the goal of the student becoming more successful in their school or daycare. Consultations with teachers and program directors can also be arranged. For children between the ages 2-7 only. The Woodcock-Johnson IV-ECAD is used to evaluate children’s cognitive abilities and shows areas of strengths and weaknesses for academic achievement. Danielle Tschirhart, M.Ed., LPC-S provides supervised training to Licensed Professional Counselor Interns who are interested in work with children and families. Danielle Tschirhart graduated from Texas A&M University in 2002 with a degree in Political Science. She received her Master’s degree of Education in Counseling from the University of St. Thomas in 2009. Prior to (and while) pursuing her Master’s degree, Danielle worked as a classroom teacher in middle school and high school settings in both the Dallas and Houston areas. Following her time as a teacher, Danielle served as the school counselor for St. Stephen’s Episcopal School for four years. After leaving the school setting, Danielle began working with Dr. Michelle M. Forrester in private practice for five years before deciding to begin her own practice. Danielle has been working as Licensed Professional Counselor Supervisor since 2015 and enjoys training new professionals in the field of counseling. Danielle is originally from Corpus Christi, Texas but has been living in Houston with her family since 2005. Danielle uses the individual needs and strengths of the children she works with to help them develop stronger social, interpersonal and behavioral skills. Molly Donovan is a graduate from Universitiy of St. Thomas, Houston with a degree in Studio Art and a Texas Teacher’s certificate in All Level Art Educationfrom University of Texas in Austin. Her Master’s degree of Education in Counseling (2015) is from the University of St. Thomas. Molly has spent over 30 years working in the classroom as a preschool, elementary, middle school and special education teacher in both the San Antonio and Houston areas. During her time as a classroom teacher she began teaching in the alternative health care industry as a therapist and yoga instructor. After leaving the school setting she has been working with Danielle Tschirhart, M.Ed., LPC-S in private practice as a Licensed Professional Counselor Intern. Molly has been working and as Licensed Professional Counselor Intern since 2016 and enjoys spending time with children of all ages. Molly comes from Houston and uses her talents in arts education while counseling both children and their families. Molly’s personal philosophy is to honor all personalities of children wherever their developmental stage is currently. Inclusion of their creativity and talents is utilized building strong behavioral and social skills. Sarah Martin graduated from Southern Methodist University in 2006 with a degree in Psychology. She completed her Master’s of Education in Counseling at The University of St. Thomas in 2010. Sarah has worked as a Licensed Professional Counselor since 2010 and has worked under the purview of Houston area psychologists, such as Dr. Maria Hammond and Dr. Lyle Cadenhead. Since 2007, Sarah has been affiliated with The Parish School in Houston, Texas, which specializes in educating children who have learning differences and communication delays, empowering them with the tools to succeed. She has served as the Director of Admissions and later as elementary counseling support. Sarah is excited to delve into private practice and begin the journey of helping children and their families in a different capacity. Sarah believes in the innate power of children to take charge of their healing, growth and development through play and connection. The therapeutic experience can help children process their thoughts, feelings and actions in a way that validates and celebrates who they are. Sarah also significantly values the role of parents as change agents in their child’s experience and looks forward to partnering with parents through the therapeutic process.